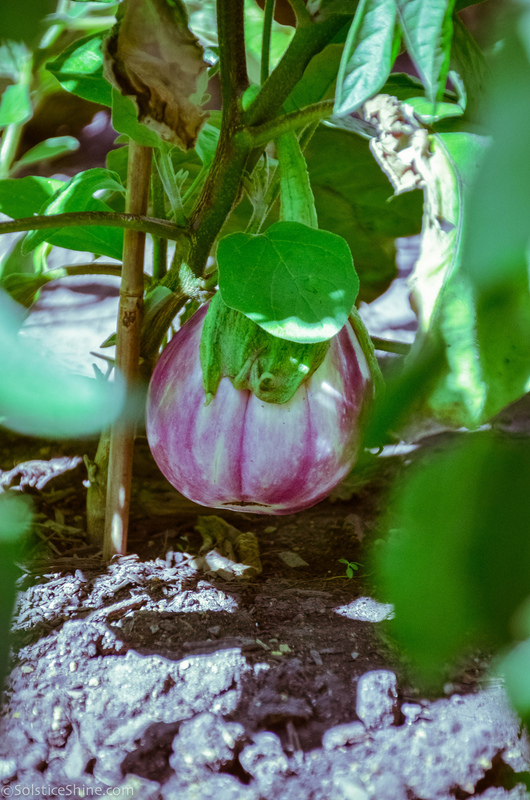 Eggplant is a summer vegetable that requires warm to hot conditions over a 5-6 month growing; therefore eggplant should be planted in full sun. Light textured soils such as sandy loams are good soil condition. Also, soil pH in the range should be 6.0-7.0. Eggplant needs about one-inch of water per week, however, young eggplant need watered more frequently than mature eggplant. In cold regions, eggplant should be grown in a green house. Eggplants stop growing when its below 12 C and above 40 C. Eggplants need to be water regularly and will grow fungus if its too humid. Use ribbons or rope to tie the stalk when it begins to lean as it grows. It’s better to allow five fruit per stalk for better fruit results. If you grow marigolds as a pest repellent for your eggplant, it's best not to grow beans as the companion vegetable, since marigold can be an herbicide to certain beans. Finally, crops should always be alternated due to soil depletion or pest attraction, so rotate your eggplant and similar plants such as peppers out of the same area and do not grow them in the same location one after the other or in consecutive years (1). Companion plants to eggplant are bush beans, pole beans, peas, spinach and the herbs thyme or tarragon. Pole beans can be staked and grown together, while the bush variety or spinach can be grown near the base of the plant, providing open space between the higher-growing eggplant while filling in the space closer to the ground and discouraging weeds. Or take a section of the eggplants and add in peas instead of beans, and use marigolds as pest repellent (2). Eggplant is used in a variety of different cuisines around the world in many different dishes. 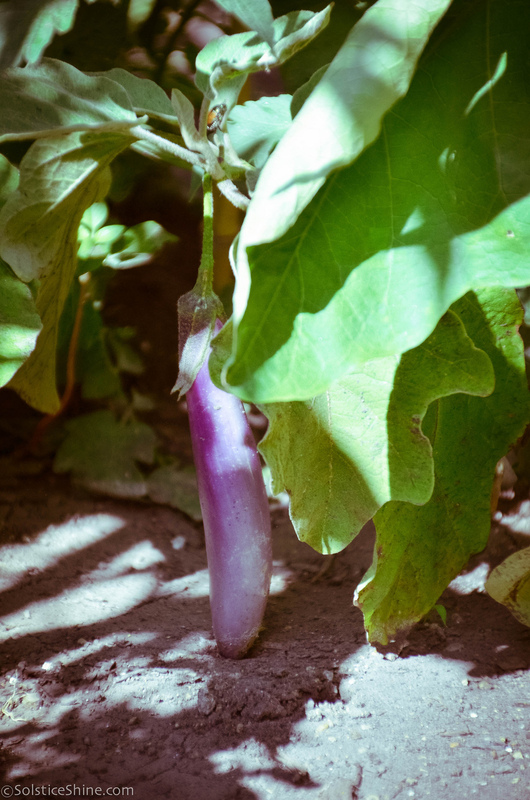 Eggplant is central to the French ratatouille, Greek moussaka, Middle Eastern baba ganoush, Italian eggplant parmigiana, and Asian stir fries and curries. It can be cooked in different ways: deep fried, roasted, sauteed, baked, grilled, mashed, braised, steamed, stewed, or stuffed. Eggplant however should not be eaten raw, as it can cause digestive upset. It is recommended to salt slices of eggplant for at least 20 minutes before cooking to get rid of water as well as bitter taste. The salt can be washed off and drained without affecting the taste (3). Eggplants have a high concentration of nasunin, which is an antioxidant found on the deep-purple outer skin. Some studies have begun to find links between nanulin inhibiting specific types of cancer cells (5). Eggplant is native to the Indian subcontinent and the earliest recorded cultivation was in China. Illustrations in Chinese botanical references dated between the 7-19th centuries AD document the alterations in eggplant's shape and size; interestingly, flavor was also selected for, as the Chinese botanists endeavored to remove the bitter flavor in the fruits (4). Several centuries ago in Northern Europe, there was a well known superstition of eggplant being the “mad apple” and causing people to become insane. The myth partially came about because of the relationship to the deadly nightshade plant, also dark purple in color. Because of this persisting myth, eggplant took centuries to become more accepted into people’s diets (5). Today, eggplant is used in many culinary dishes around the world; certain varieties of eggplant point to the region they are grown in, namely Chinese eggplant and Ichiban Japanese (dairyu) eggplant. In Japan, it is considered good luck to dream of Mount Fuji, a hawk, and an eggplant on hatsuyame, the first dream of the new year. The Japanese word for eggplant suggests something great to come (6).